The Polar Bear Mouse is a breed of mouse found in the Slushy Shoreline and the Iceberg. It is known to drop a variety of loot. Magical genetic engineering sure has come a long way! This beefy mouse has been augmented with the strength, ferocity, and terrifying features of a genuine polar bear. As a front-line invader, he strikes fear into the heart of whomever he opposes. The Polar Bear Mouse has no specific preference for any kind of cheese. Hydro traps are of normal effectiveness against the Polar Bear Mouse. The Polar Bear Mouse is known to drop War Scrap as loot. It also drops Cheddar Powder, but only when a Hunter is working an M400 Bait Research Assignment. The encounter rate for the Polar Bear Mouse can be decreased by arming the Magnet base. Arming a Wax Charm will increase the distance of a successful catch, and arming a Sticky Charm will reduce the distance lost from a miss. The Polar Bear Mouse drops Hunting Research (5000 points), Satchel of Gold (2000 gold), Sticky Charm and Wax Charm as loot. It also drops Cheddar Powder, but only when a Hunter is working an M400 Bait Research Assignment. The Polar Bear Mouse drops Frozen Sealed Bottle, Hunting Research (5000 points), Satchel of Gold (2000 gold), Sticky Charm and Wax Charm as loot. It also drops Cheddar Powder, but only when a Hunter is working an M400 Bait Research Assignment. The Polar Bear Mouse drops the Iceberg Egg and Slushy Shoreline Egg during the annual Spring Egg Hunt. 30 April 2012: The Polar Bear Mouse was released in the Bazaar, Calm Clearing, Cape Clawed, Crystal Library, Great Gnarled Tree, Harbour, King's Arms, Laboratory, Meadow, Mountain, Muridae Market, S.S. Huntington II, Town of Digby, Town of Gnawnia, Training Grounds, and Windmill. While available in these locations, Arcane, Draconic, Forgotten, Physical, Shadow, and Tactical power types were listed as less effective against it. 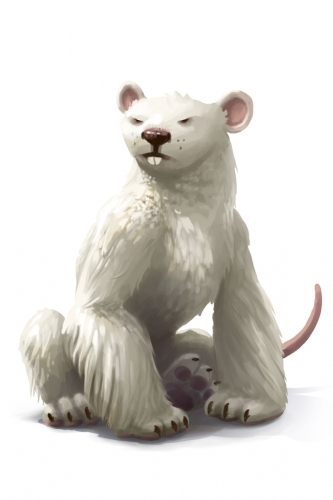 7 May 2012: The Polar Bear Mouse moved locations and could only be found at the Slushy Shoreline where the range of power types effective against it was reduced to Hydro only. 14 May through 24 May 2012: The Polar Bear Mouse dropped Interlocking Hull Fragments. 1 June 2012: The Polar Bear Mouse began to drop loot in the Iceberg location. 18 June 2012: The Polar Bear Mouse began to drop Frozen Sealed Bottle as loot. This page was last edited on 17 October 2017, at 20:13.